Wendy Wagner was an accomplished, award-winning artist who embraced youthful innocence through her multi-dimensional talents. Known for a variety of whimsical expressions in paint, ceramic, sculpture, and animation, her colorful works of art seemed to come from an imaginative child with amazing technical skills. Inspired by childhood memories, feelings for pets, and personal events, Wendy said her creations blended reality with fantasy to help us identify with our playful inner-spirit, laugh at ourselves, and not take life too seriously. In September 2014, Wendy succumbed to a bout with brain cancer at age 47. She left an artistic legacy that includes 16 solo exhibitions reaching as far as Japan and features numerous group shows reaching as far as Mexico. In 2008, Wendy’s mixed-media mural, I Hope I’m Dreaming won the prestigious Hunting Art Prize and gained international attention with two solo exhibitions at the G-Trinity Gallery in Tokyo in 2009 and again in 2010. Remarkably, within just one year of learning of her illness, Wendy’s most ambitious exhibition came to the Women & Their Work Art Gallery in Austin. Then in 2013, her show, Look to the Left was covered by The New York Times. Following her diagnosis in April 2012, and after multiple surgeries, radiation, chemotherapy, and clinical trials, Wendy was released from treatment and expected to live only a few weeks. It was then that her inner strength and amazing beauty as a person revealed itself as her illness progressed. While her functioning skills became greatly impaired, specifically her peripheral vision, Wendy used these changes in her abilities as therapeutic meditation and creative inspiration to craft a series of designs that embraced the beauty of life and all it may bring. Wendy continued creating art until the end of her life more than 18 months later. Look to the Left became a stirring expression of her enduring optimism and stands today as a living testament to her vibrant, artistic spirit, affectionately embraced by her family, friends, and the Houston art community. 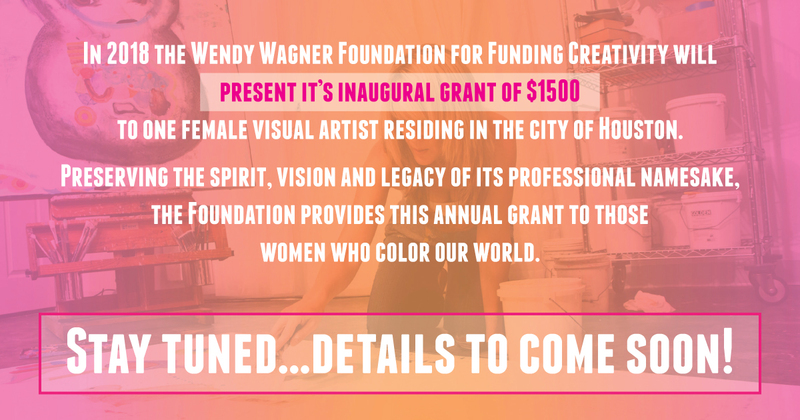 Wendy Wagner’s continuing legacy lives on through the Wendy Wagner Foundation, which empowers women artists throughout Houston working across a wide array of disciplines and in all stages of professional development. Preserving the spirit, vision and legacy of its professional namesake, the Foundation provides creative mentorships, workshops, grants, and artistic scholarships to those women who color our world. Discover how you can help make a difference with this mission and donate generously today.